Question: How do different surface types (glossy, cork, sand, and gravel) affect how a hovercraft hovers. Hypothesis: We think the hovercraft will preform similarly on different surfaces, but think it will go the farthest on a glossy surface. 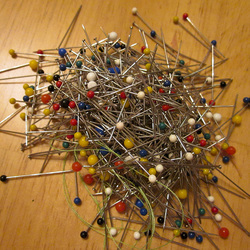 ​Be careful when using hot glue gun and straight pins. Cover the center hole on the top side of the CD or DVD with a piece of tape and poke about 6 holes in the tape with a straight pin. Use the hot glue gun to glue the cap to the top center of the CD or DVD disc, covering the center hole. Then put the craft on a smooth surface and pop the top open and push the hovercraft. Special Needs: For our large hovercraft (see next section), we will need a long, smooth, (tiled or wooden) floor space. We will also need an outlet for our hot glue guns. 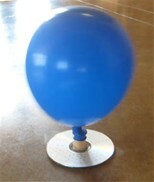 The air flow created by the balloon causes a cushion of moving air between the disc and the surface. This lifts the disc and reduces the friction which allows the disc to hover freely. ​- try the hover craft on other surfaces to observe how it affects hovering. In conclusion, our hypothesis was correct. It was correct because it preformed well on a glossy and cork surface.The air flows through the tape, creating a thin air cushion under it which reduces the friction. As a result, the hovercraft will perform similarly when pushed over different surfaces (glossy or cork). I am 10 years old and in 5th grade. I have one older sister in 7th grade at SMS. I love to dance and play the viola and piano. My favorite subject in school is science. I am 10 years old and in 5th grade. I have younger twin sisters in 3rd grade at SIS. I love to dance and ride horses. I also play the violin and electric guitar. I have two adorable German Shepherds, two fish and two frogs.